Glassblower.Info - Glassblowing Diamond Shears from around the Web and the World! There are many different types of Glassblowing Diamond Shears available off-the-shelf, and a glassblowing student may find that a good pair of jacks is their third investment (after safety glasses and a blowpipe/punty and jacks). The geometry of this new shear allows for quick opening (even with small hands) and large capacity. These shears are lightweight. We have replaced our Combination Shear with the Dante Diamond! Small Handle Option is available at no extra charge. Description: Not everyone on the planet needs a massive Diamond Shear, so we make it in other sizes. The Standard Diamond Shear is made with full sized hand loops, finger stops and a four inch blade. A very solid, extremely popular tool. Description: In response to many customer requests, we started making the Compact Diamond Shear. It has the same blade as the Standard Diamond Shear, but with smaller loops and shorter finger stops. For those with smaller paws, this is a much better fit. Description: The Big Dog. Designed to chew through big hairy gathers and bits with ferocity and efficiency. The elongated handle keeps the work from boiling your shearing limb. Nicely balanced design and bulletproof construction combine to make a great working tool. 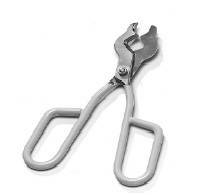 Essemce Glassworking Tools - available from C & R Loo DIAMOND SHEARS - GS SERIES Essemce diamond shears are multi-purpose shears. The inside has a diamond shaped cutting area for cutting off round shaped additions. The ends of the blades have a curved section that does not have a cutting edge and is designed for holding and moving pipes and punties. In addition, the tip can also be used to hold and move round handles, etc. The outer tip of the shears are ground to a fine point which enables the shears to be used as tweezers for digging into and pulling on glass. Available in 4 sizes. Order N for normal handle, S for small handle. Small Shears. The overall dimension on these shears is 9" long with a blade length from tip to pivot point of 3".